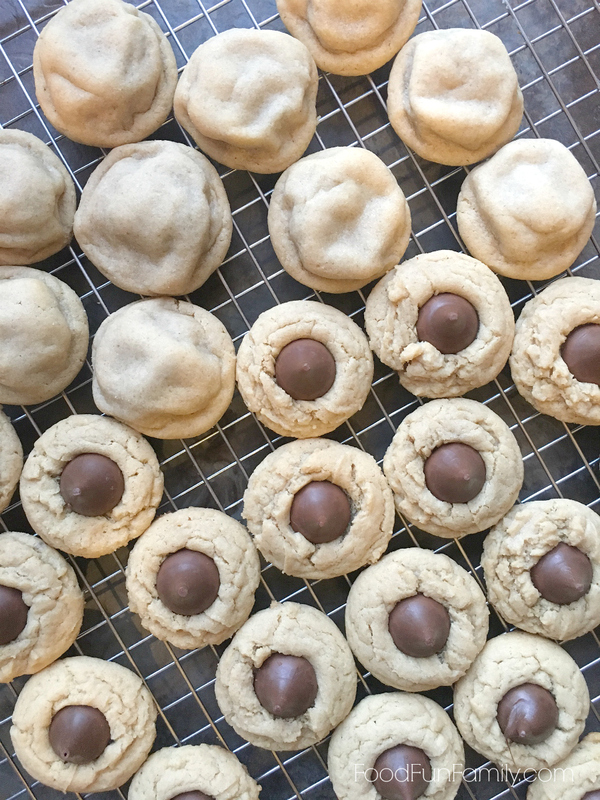 My husband has been making peanut butter cookies topped with Hershey’s Kisses for years. 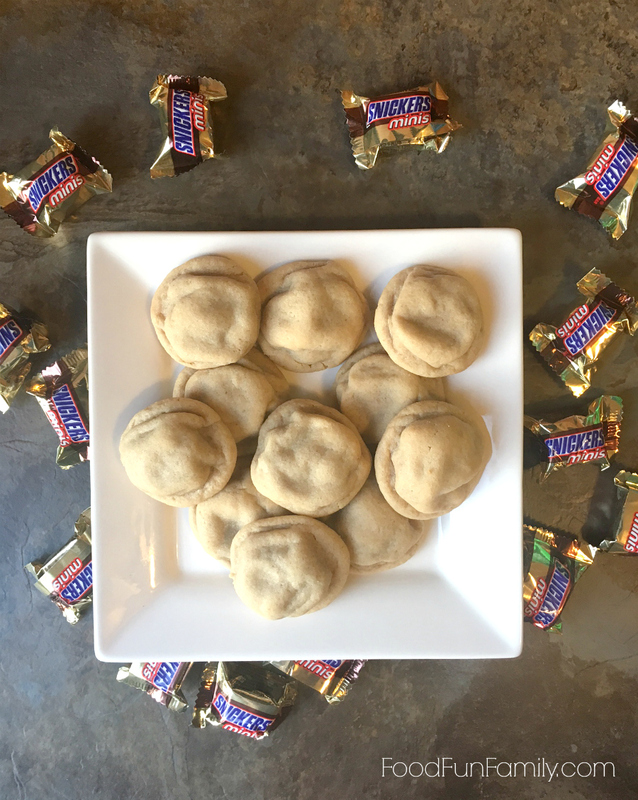 One year, ages ago, we ran out of Kisses in the middle of a batch but happened to have a handful of Snickers minis left over from Halloween trick-or-treating in the kitchen. I don’t recall if we tried the Snickers on top of the cookies to start out, or if we tried them stuffed inside the cookie dough from the beginning. Either way, the Snickers-stuffed peanut butter cookies quickly became MY favorite variety, and we’ve been making them ever since. 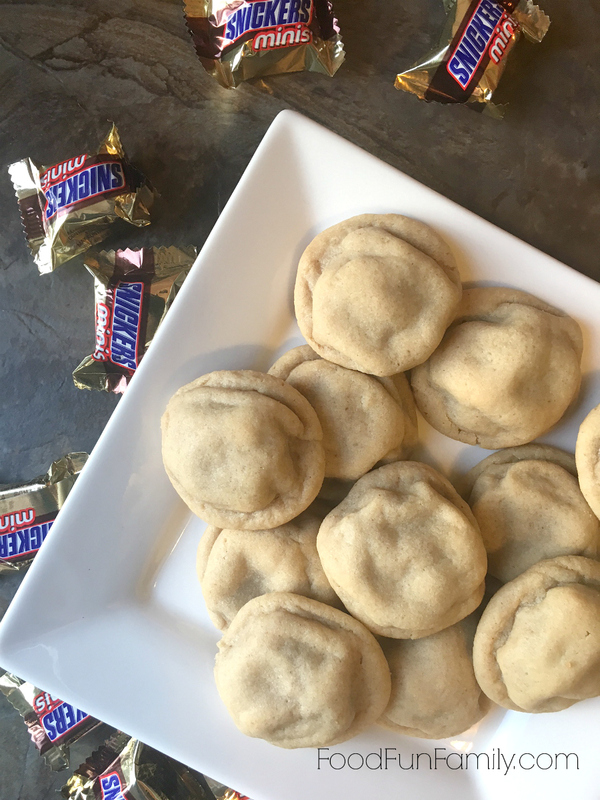 We don’t make Snickers-stuffed cookies that often, but they always make an appearance during the holiday season. And when we make them, I can’t stay away from them! It’s funny how baking two delicious things together like this makes the finished result taste better than either of the things on their own. Trust me. These cookies are to die for! This recipe is based on my husband’s famous peanut butter blossoms recipe – it really IS the BEST! The only difference is that we wrap the dough around Snickers minis before baking. One little tip: you really don’t need more than a small spoonful of dough – just enough to cover the snickers. When you place the dough “balls” on the cookie sheet, keep them as balls. Don’t flatten or spread them out. In a large bowl, combine flour, baking soda, salt. In a separate bowl, combine both sugars, butter, peanut butter, milk, vanilla, and egg. Using hand beaters, mix wet ingredients til they're creamy. Add ingredients of the wet bowl into the bowl with the dry ingredients and stir until they're thoroughly mixed. Wrap a small spoonful of dough around each mini Snickers - you just need a small spoonful of dough to cover the candy. Place each cookie dough-covered Snickers onto cookie sheet. Bake at 375°F for 9-11 minutes, or until slightly browned. Let cookies cool on the cookie sheet for a couple of minutes and then remove them to a cooling rack. Another tip that I highly recommend…Be sure to grab a couple while they’re warm! There is nothing like a warm peanut butter cookie with melty chocolate and caramel on the inside! I’ve also used Milky Way and 3 Musketeers, which both work just fine, but the Snickers result in the best cookies, in my opinion. And be sure to grab the recipe for the original peanut butter blossoms cookies, too! I have made the peanut blossoms for years but this recipe may be kicking that one to the curb. How delicious. What lovely they are! That is so exciting idea. I will try to make for my kids. These cookies are wonderful!!! The hardest part was not eating the Snickers while I was unwrapping them. It was worth the wait, when I bit into the cooked, warm, goodie I was amazed. Love them!!! You are exactly right!! Totally worth the wait for that warm, gooey goodness! These cookies are amazing and I want to make them and have for the kids. They look like a lot of fun to make. thanks for the recipe! I love this idea! 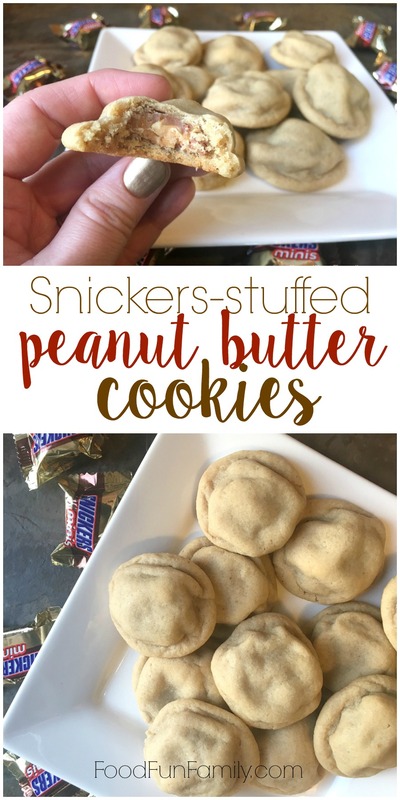 I love Snickers, plain, frozen, and now I must try it in the cookie – Wow! This sounds great!! Would love it if you shared it at our What’s for Dinner Link up!! Snickers and Peanut Butter are my two favorites, so I am definitely going to make this recipe. Thanks for the post. The pictures look delicious! O my goodness, little pouches of wonderful! That is a great idea. Now that’s what I call a happy accident! 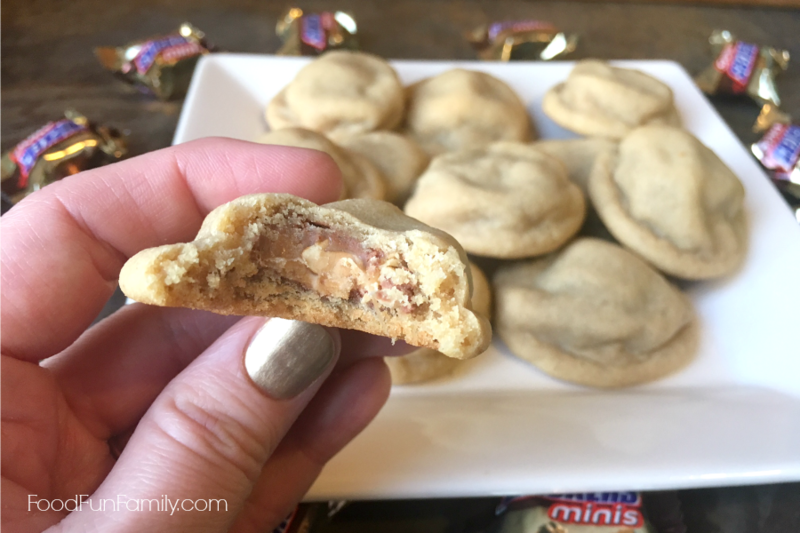 We make peanut butter blossoms every year too but I’d have to agree – these are special.